Take the best possible care of your cooling system with professional maintenance from Steel T Heating & Air Conditioning. We make sure to keep those energy bills at a minimum every month. With timely upkeep, handled by our NATE-certified specialists, you’ll benefit from optimized cooling and dehumidification capacity, healthier air quality, fewer repairs, and extended system lifespan. We work on all makes and models of HVAC equipment, offering trusted solutions to homeowners across Littleton, Lakewood, Centennial, Highlands Ranch & Englewood, CO. Through proactive measures, we help you avoid emergency repairs on the hottest night of the year, and minimize disruption with an annual appointment that fits conveniently into your schedule. The uniformed technicians from Steel T Heating & Air Conditioning deliver a rewarding experience by showing up on time, prepared to handle every aspect of the job. We maintain an organized work site, and clean up any debris or discarded equipment. The entire procedure is completed quickly and accurately, with nothing for you to do but enjoy the long-term rewards! Contact Steel T Heating & Air Conditioning for air conditioning service you can feel confident in! As a Carrier Factory Authorized Dealer, Steel T Heating & Air Conditioning performs a comprehensive and proven-effective task list that increases the value of your investment and protects your ongoing satisfaction. We settle for nothing less than peak condition from components, and work diligently to restore sound, efficiency, and performance levels. If replacement parts are required, we reach first for genuine Factory Authorized parts to ensure durability. By catching issues with wear and tear, the buildup of contaminants in the system, or problems with leakage or overflow, we head off property damage, health risks, and premature system failure. 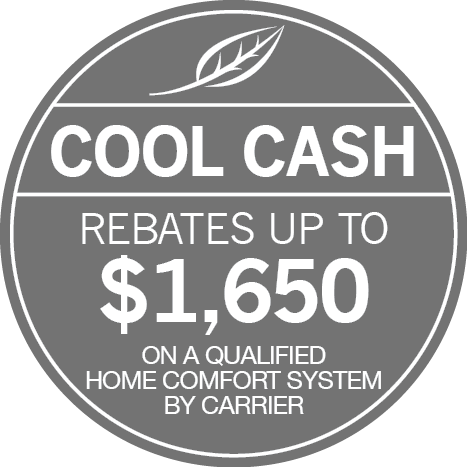 We get your air conditioner ready for the upcoming summer heat, and ensure a refreshing cool home, season after season. When homeowners in Denver Metro Region take advantage of a maintenance plan from Steel T Heating & Air Conditioning, they take their comfort for granted.